Which also means spring cleaning is just around the corner. This year, consider including your children in this annual home ritual. Through age-appropriate tasks, children acquire important social skills as they continue to learn what it means to be a part of a family. Children learn responsibility, how to care for materials and pets at home, and how to work cooperatively with family members to get things accomplished. The 2015 Texas prekindergarten guidelines suggest that right around the time a child turns four, he or she begins to recognize personal roles in the classroom environment which is demonstrated through readily accepting and carrying out “classroom helper” jobs (page 41). At Stepping Stone School, our classroom teachers invite children to participate in the responsibilities within the classroom through cleaning up after themselves beginning in our infant classrooms and continuing through our pre-kindergarten programs. Several of our older classrooms create chore charts in which each child is assigned a specific responsibility for the day or the week. Families can continue to work on these skills at home by involving children in the upkeep of their home. Even before age four, children can learn to take care of materials and to take responsibility for personal messes. Toddlers, especially love to imitate parents in their work at home. Developmentally, toddlers learn through imitation and parallel play. manner. Whether it is moving laundry from the washer to the dryer, putting plastic dishes into the dishwasher, or stirring her bowl of imaginary food as you prepare dinner, young children learn through these daily interactions. 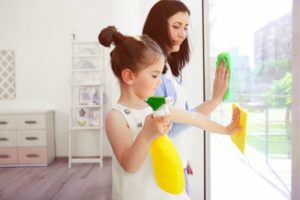 The following are some ideas of age appropriate household chores in which children can participate. Each list builds on the previous age group list. With supportive teaching in the beginning and consistency through training, children will learn responsible ways to participate in the daily tasks and chores at home. 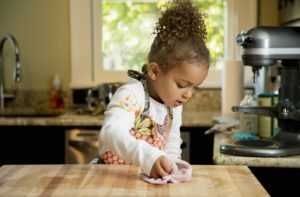 Each age group set of chores relates to skills children are naturally developing. With increased physical development and cognition, children are able to complete more challenging tasks at home.